Home Asus News Smartphones ASUS ZenFone 5 Series Coming to PH on April 14! 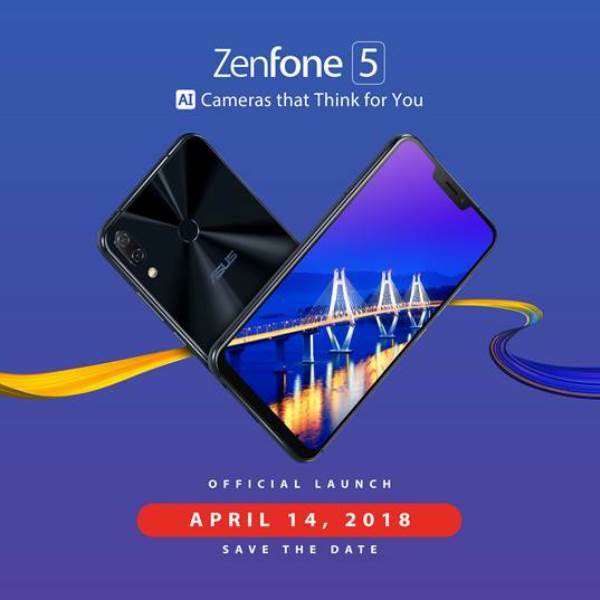 ASUS ZenFone 5 Series Coming to PH on April 14! It’s official! ASUS Philippines has announced that the brand’s latest ZenFone 5 series will land in the local market on April 14. Going #Backto5, the mobile manufacturer has tagged its latest smartphone line as the most intelligent ZenFones available yet as it is equipped with A.I. Technology. As a recap, the 5Z variant sports a 6.2-inch 19:9 display with 90% screen-to-body ratio. Inside, it packs Snapdragon 845 processor, Adreno 630 graphics, 8GB of RAM, and 256 of internal storage. Camera wise, it boasts 12-megapixel Sony IMX363 + 8-megapixel 120-degree wide-angle rear cameras, and 8-megapixel front shooter. The device is accompanied with 3300mAh battery. Moving on to the ZenFone 5 model, the device has the same 6.2-inch 19:9 FHD+ IPS display as the 5Z. Under the hood, it is powered by Snapdragon 636 processor with A.I. capabilities, which is paired with Adreno 509 graphics. The handset is coupled with up to 6GB of RAM and 64GB of internal storage, as well. On the other hand, the 5Q is a smaller 6-inch smartphone that has a Full View 18:9 screen ratio. It is geared with 20-megapixel Sony at the front, 16-megapixel at the rear, and a secondary 120-degree wide-angle camera at both front and rear. Meanwhile, its pricing, online reservation, and bundled freebies will be announced soon! So, stay tuned for more updates!